by Diane - March 11th, 2014. 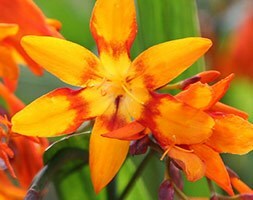 Position: full sun or partial shade Soil: moderately fertile, humus-rich, well-drained soil Rate of growth: average to fast-growing Flowering period: August to October Hardiness: frost hardy (needs winter protection in cold areas) Arching spikes of crimson-splashed, bright orange, freesia-like flowers appear in August and October among sword-like, mid-green leaves. 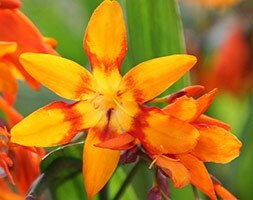 These magnificent montbretia are perfect for a mixed border in a sheltered, sunny site. The wiry stems are self-supporting. For maximum impact plant in bold drifts in a sunny, sheltered site with moderately fertile, humus-rich, well-drained soil. It makes an excellent cut flower. Garden care: Resist removing the faded foliage in autumn and cover the crown of the plant with bracken or bark chips to protect the plant against frost damage. Lift and divide congested colonies in spring, planting the divided sections 8-10cm (3-4in) deep. Position: full sun or partial shade Soil: moderately fertile, humus-rich, well-drained soil Rate of growth: average to fast-growing Flowering period: August and September Hardiness: frost hardy (needs winter protection in cold areas) Arching sprays of bold, tomato-red, funnel-shaped flowers appear in August and September among handsome, pleated, mid-green leaves. This vibrant bulbous perennial is perfect for a mixed or herbaceous border in a sunny, sheltered site or as part of a ‘hot’ colour scheme. For maximum impact plant in bold drifts in a sunny, sheltered site with moderately fertile, humus-rich, well-drained soil. They make excellenllent cut-flowers. Garden care: Resist removing the faded foliage in autumn and cover the crown of the plant with bracken or bark chips to protect the plant against frost damage. Lift and divide congested colonies in spring, planting the divided sections 8-10cm (3-4in) deep. 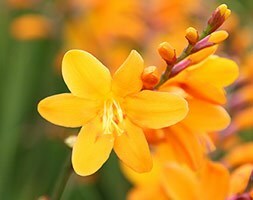 Position: full sun or partial shade Soil: moderately-fertile, humus-rich, well-drained soil Rate of growth: average to fast-growing Flowering period: July and August Hardiness: frost hardy (needs winter protection in cold areas) This bulbous perennial has sword-like, green leaves and arching spikes of rich amber-yellow, freesia-like flowers in July and August. 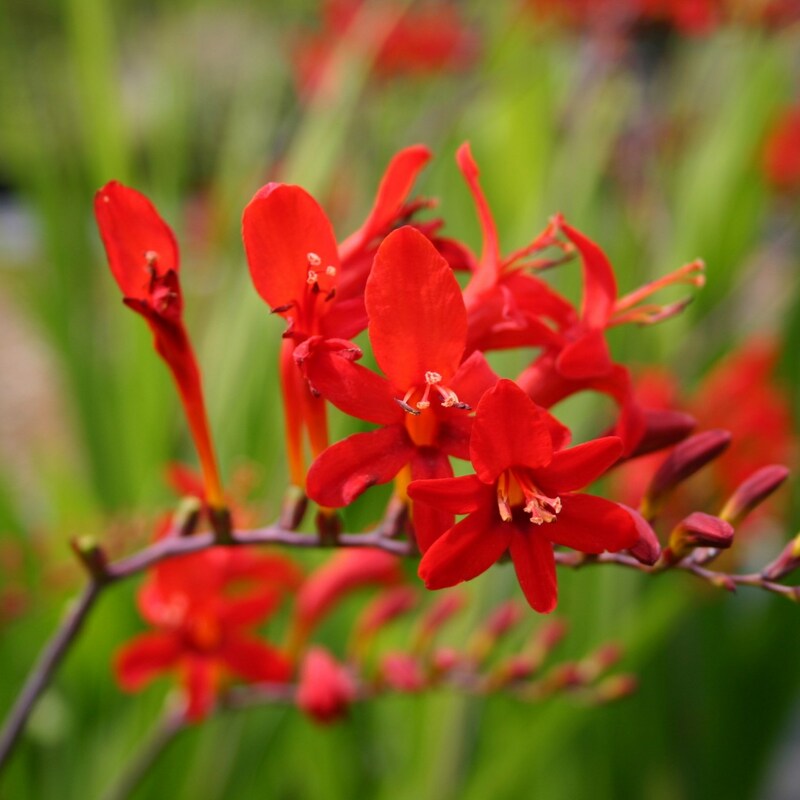 These cheerful montbretia are perfect for a planting scheme based on ‘hot’ colours. For maximum impact plant in bold drifts in a sunny, sheltered site with moderately fertile, humus-rich, well-drained soil. Garden care: Resist removing the faded foliage in autumn and cover the crown of the plant with bracken or bark chips to protect the plant against frost damage. Lift and divide congested colonies in spring, planting the divided sections 8-10cm (3-4in) deep. Position: full sun or partial shade Soil: moderately-fertile, humus-rich, well-drained soil Rate of growth: average to fast-growing Flowering period: July and August Hardiness: frost hardy (needs winter protection in cold areas) One of the earliest montbretias into bloom each year, this cultivar produces arched branching stems of large, pale yellow flowers, which are flushed with orange above strap-shaped green leaves in summer. Garden care: Plant the corms (bulbs) in spring approximately 8-10cm deep and 10-15cm apart. Resist removing the faded foliage in autumn and cover the crown of the plant with bracken or bark chips to protect the plant against frost damage. Lift and divide congested colonies in spring, planting the divided sections 8-10cm (3-4in) deep. Position: full sun or partial shade Soil: moderately fertile, humus-rich, well-drained soil Rate of growth: average to fast-growing Flowering period: August and September Hardiness: frost hardy (needs winter protection in cold areas) Masses of bright red flowers are produced along the top of the slightly arching spikes in midsummer. This is a vigorous plant with sword-shaped, pleated, mid-green leaves. It is perfect for planting in big, bold swathes through ‘hot’ themed borders, and its upright habit and airy sprays of flowers make it an ideal partner for many flowering grasses. The flowers are also excellent for cutting. Garden care: Plant the corms (bulbs) in spring approximately 8-10cm deep and 10-15cm apart. Resist removing the faded foliage in autumn and cover the crown of the plant with bracken or bark chips to protect the plant against frost damage. Lift and divide congested colonies in spring, planting the divided sections 8-10cm (3-4in) deep. 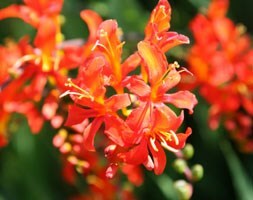 Position: full sun or partial shade Soil: moderately fertile, humus-rich, well-drained soil Rate of growth: average to fast-growing Flowering period: August and October Hardiness: frost hardy (needs winter protection in cold areas) Wiry, arching stems carry large, pendulous or horizontal, bright orange flowers that have reddish-purple blotches at their base in late summer. Beautiful in bold drifts and excellent cut flowers. Garden care: Plant the corms (bulbs) in spring approximately 8-10cm deep and 10-15cm apart. Resist removing the faded foliage in autumn and cover the crown of the plant with bracken or bark chips to protect the plant against frost damage. Lift and divide congested colonies in spring, planting the divided sections 8-10cm (3-4in) deep. Position: full sun or partial shade Soil: moderately-fertile, humus-rich, well-drained soil Rate of growth: average to fast-growing Flowering period: August and September Flower colour: tomato-red Other features: excellent cut-flowers Hardiness: frost hardy Funnel-shaped, bright orange-red flowers are borne on arching stems from mid summer and seem to hover just above the pleated, bright green leaves. Grow them at the edges of a shrub or mixed border where it will add clumps of intense, late summer colour. This montbretia will become quite tolerant of drought once it has had a chance to become established and it spreads to form a good-sized clump. The flowers are excellent for cutting. Garden care: Plant the corms (bulbs) in spring approximately 8-10cm deep and 10-15cm apart. Resist removing the faded foliage in autumn and cover the crown of the plant with bracken or bark chips to protect the plant against frost damage. Lift and divide congested colonies in spring, planting the divided sections 8-10cm (3-4in) deep.